Personalized whiskey decanter set is a perfect gift if you want to make someone really happy. 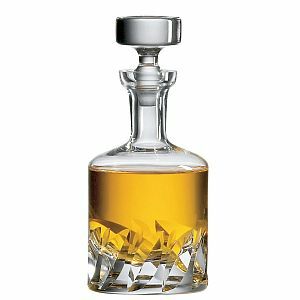 While classic whiskey decanters and decanter sets are also great, personalized decanter makes it even more valuable and personal asset. If you are looking for personalized whiskey decanter you came to the perfect place: here are two of our favourite whiskey decanters that you can personalize with your engraved initial and make it a real gem in your personal bar. Personalized Whiskey Decanter Monogram Decanter is a customized whiskey decanter from Cathy’s Concepts Contemporary product line. 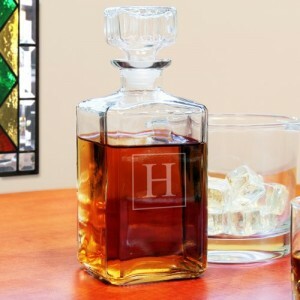 This isa beautiful whiskey decanter personalized with your own monogram. It includes beveled stopper with plastic insert, free personalization and square structure. This decanter is dishwasher safe so you don’t have to worry about cleaning it in your dishwasher. It also has a great capacity because it can hold up to 25 oz of your favourite whiskey, bourbon or any other liquor. Dimensions of this decanter are 9 in. Height x 4 in. Width x 4 in. Materials used to create this whiskey decanter are clear glass and plastic used for the stopper. It may be engraved with a single block initial displayed on the bootle. This engraving service is included in the price so you don’t have to pay extra to make it personalized. The modern look and possibility to engrave your initials or initials of your friend make it a perfect gift. It currently sells for only $45. If you prefer to purchase the whole personalized whiskey decanter set instead of only decanter this product is perfect for you. 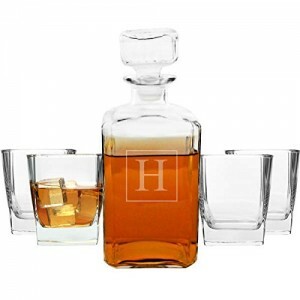 Personalized 5 piece Decanter Set includes the same decanter described above but it also ships with 4 stylish and elegant whiskey glasses to make it a complete set. It can be able personalized with single block initial at no additional cost. This is a best selling product from RaeBella Weddings & Events New York. Capacity of the 4 whiskey glasses is 10.5 oz, just enough to enjoy your favourite whiskey, scotch or bourbon. The whole product is hand made for the highest quality, the glasses are heavy and stable. Ideal for any home bar collection or as an original gift. The price for this personalized set is $75.95.